Ice cream headaches are brief, piercing headaches that can happen when you eat or drink something cold. Frozen drinks, ice cream or any other cold beverage or food can have the same "brain-freeze" effect. The good news is that most ice cream headaches are gone in the time it would take you to say their medical name- "headache attributed to ingestion or inhalation of a cold stimulus". 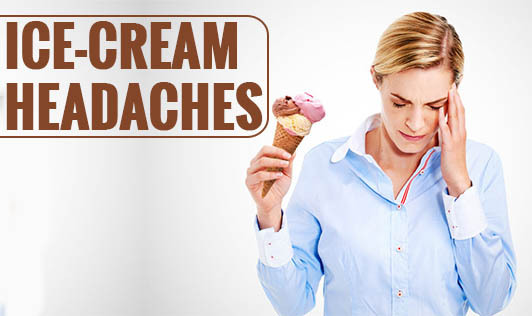 Ice cream headaches are caused when one consumes cold foods or beverages quickly. When the cold substance touches the roof of the mouth (palate), it results in rapid constriction and swelling of blood vessels or a "referring" pain from the roof of the mouth to the head. This is what causes a typical ice cream headache. To help prevent ice cream headaches, try drinking and eating cold foods and beverages slowly. Keeping it in one's mouth long enough for the palate to become used to the temperature is an effective preventative step. The only way to avoid getting ice cream headache is to keep away from the cold food or drinks that cause them.